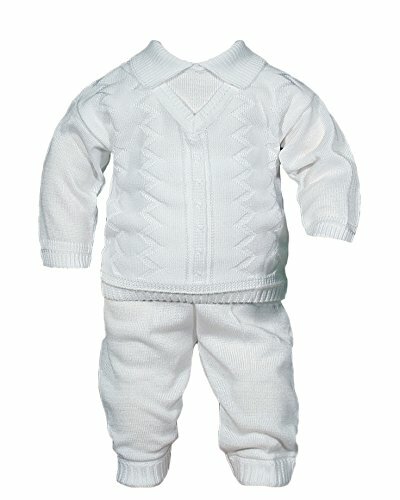 This is one of the most masculine yet baby looking boys two piece christening sets possible. Features knit V-neck sweater with built-in collar and matching knit pants. You get the look of a three piece set with a pant, top and vest with the convenience of a two piece, only having to put one piece over the baby's head. The 100% mercerized cotton knit is exquisitely finished to provide a soft, comfortable and stylish outfit. Imported. Shipped on plastic hanger in poly bag. Available in sizes NB, 3, 6, 12, 18, and 24 month. About Little Things Mean a Lot Founded in 1983, Little Things Mean a Lot offers a wide variety of heirloom quality christening gowns, outfits and accessories. They currently stock more than 150 gowns, outfits, accessories, and g!fts. Over the years, Little Things Mean a Lot has become the premier specialized infant baptism, blessing outfit, and christening wholesaler in the United States. Perfect for Christening, First Communion, Weddings, Formal Events, or Any Special Occasion! If you have any questions about this product by Little Things Mean A Lot, contact us by completing and submitting the form below. If you are looking for a specif part number, please include it with your message.